At Serena Beach Resort & Spa, my date waddles like a duck, a monkey organizes a banana heist, and then we cradle butterflies. She was waddling. At first, I thought it was a joke. But then she couldn’t go down the stairs, and I was laughing too hard to help. When I realized she was serious, I helped her down the staircase. I was still laughing all the way to Nyota Bar, and now she was angry because not only couldn’t she walk, but she also couldn’t laugh. Many things had led to this point. 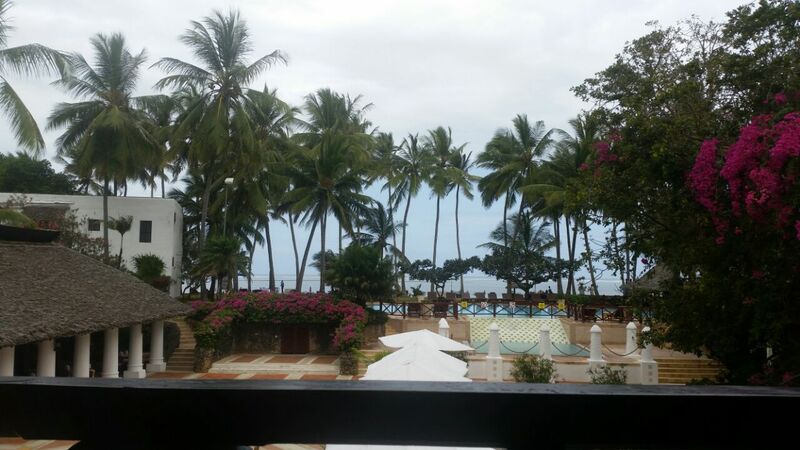 One was that were at Serena Beach Resort & Spa for our last 36 hours of an entire week doing mostly nothing in Mombasa. There were many people involved in this, but only one man with a cheeky smile was to blame for the waddling that last evening. He called himself Captain Jack Sparrow, which would have been odd if we were not sitting for dinner at Jahazi Grill. Jahazi is a dhow-inspired grill that serves freshly-caught seafood. 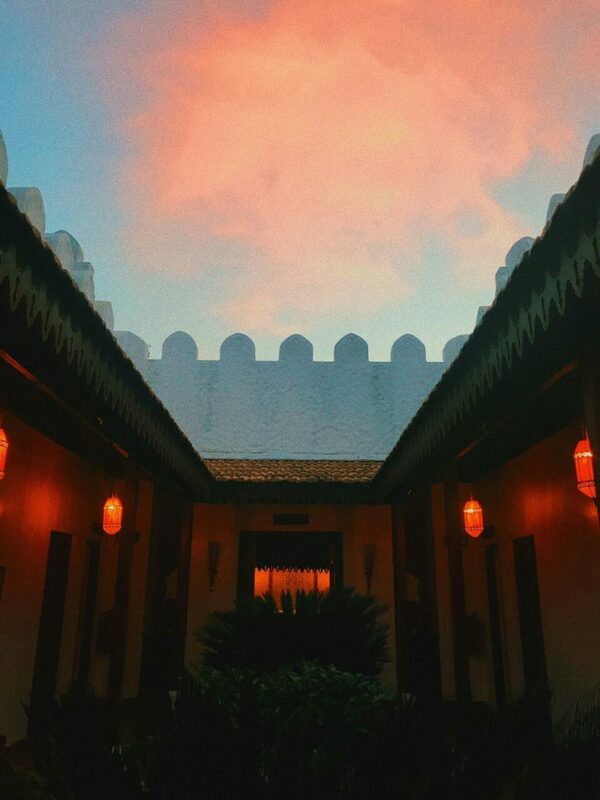 But it is more than a grill; the ground floor has a sandy floor, like it was built on the beach itself, and the upper one is designed like the upper deck of a dhow. 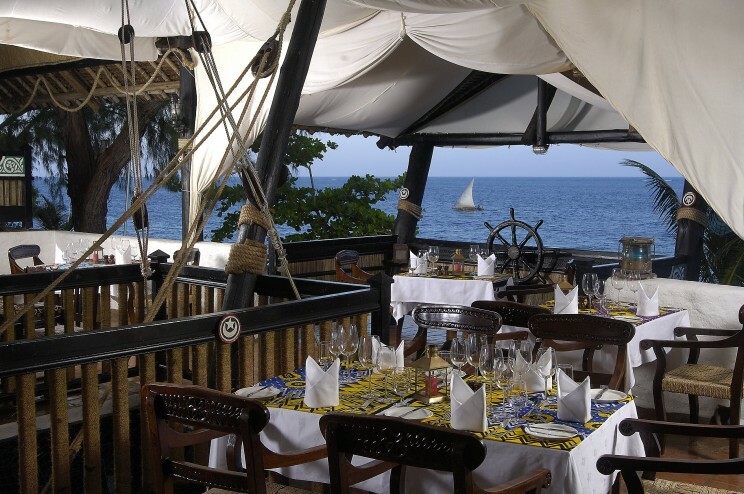 It is just one of ten ways you can explore the food at Serena Beach Resort & Spa, but it was by far my favorite. Just don’t trust Jack Sparrow’s coy smile when you ask him to help you order. Even after I wrote about not trusting the staff at Lake Victoria Serena about the quantity of seafood, I mistakenly told Capt. Jack Sparrow to wow us with dinner. It’s the quantity that often worries me; the quality and service are always top-notch. But I’m a poor feeder and I need space for rum after a heavy meal. I would also not want to waddle, like my date, in a long flowing strapless red dress, would be after this particular one. Capt. Jack Sparrow brought us soup, and quickly exited. We should have known he was fleeing, because by the time he came back with prawns for her and fish for me, we were already 85% full. It was a quiet evening but for the sound of the sea, the wind making music with the palm trees and a duet strumming a guitar in the background. The two men sang for us the whole dinner, and they were one of the reasons I was in such high spirits. At some point, they’d switched to mugithi, and in the song, one was telling the other that love will kill him, and that he’s going broke because he spends all his money on love and can’t even afford a boda boda home. It was hilarious, so much so that I had bouts of laughter trying to translate the jabs to my date. Little did we know that Capt. Sparrow was in the kitchen, planning to make one of us waddle and the other almost die for laughing about it. When I was in Lamu in 2013, I met a man called Chief Fankupy. He went on and on about how we couldn’t get models at that time of day—it was 2pm—because everyone was home loving each other. 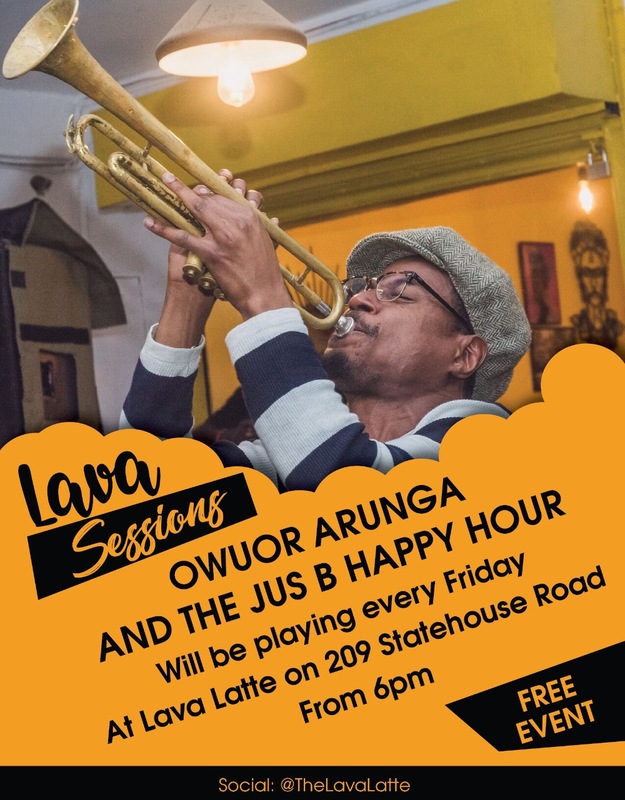 I can’t remember his exact lines, but at some point he said, with a serious face just about to break into a smile, “You can’t Google Lamu, you have to experience it.” That line has stuck in my head since, because he was right. 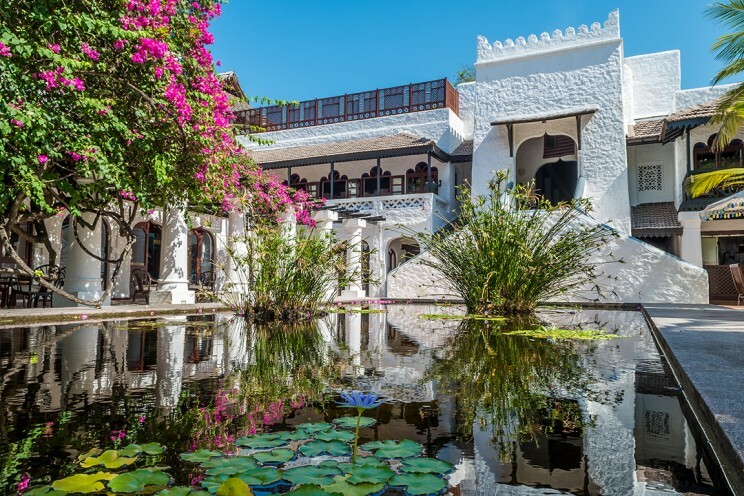 There’s no place like Lamu, because that 13th Century city-state is a feast for the senses. 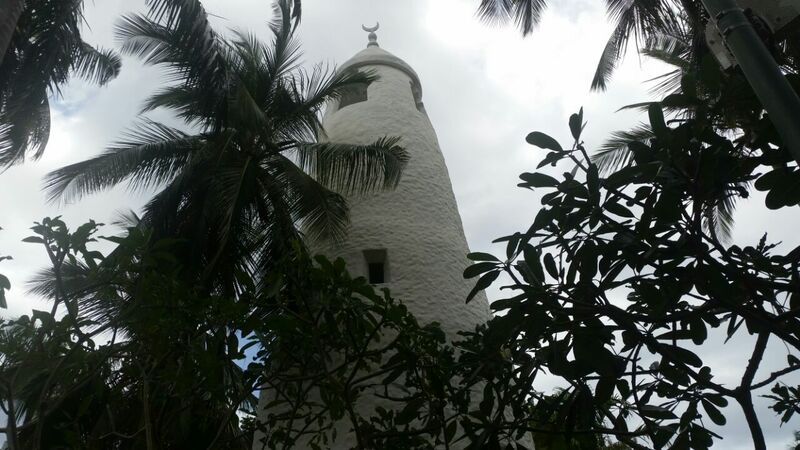 Then, four years later, I found myself in a place just like Lamu. This is the spa. I want to live here. The tower, with a minaret at the top. I think this particular resort shouldn’t call itself a resort, because it’s a town. And not even one, but many. The only thing that told me we weren’t in Lamu once the cab drove into the Serena Beach Resort & Spa driveway was that we were in a car, and there were no donkeys. 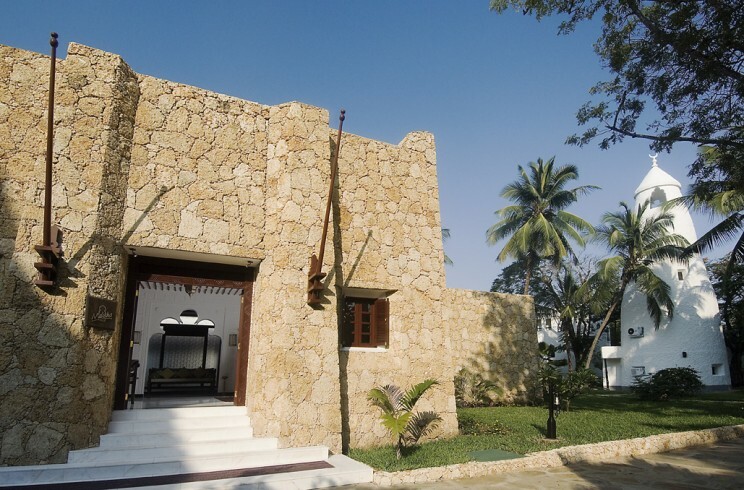 The massive Lamu door to the lobby might as well have been in one of the buildings on the 13-century island. I was there all over again, mostly. 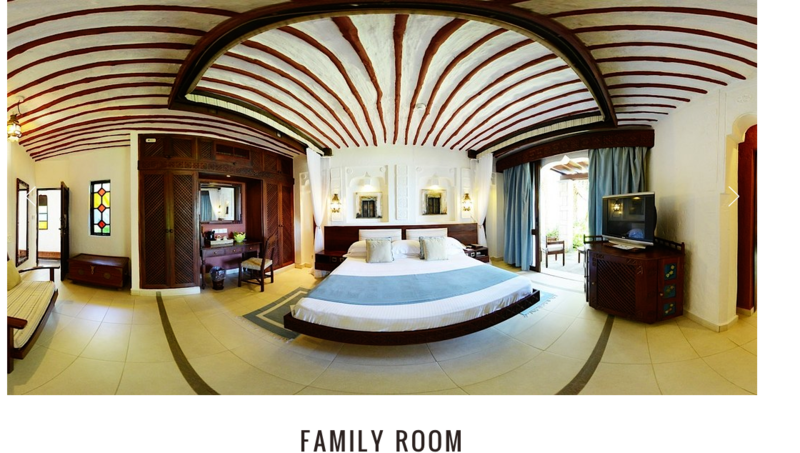 Although the main influences of the hotel’s architecture are from Lamu, other things such as towers are from Mombasa Island, and several other influences from different Swahili city-states such as Gedi. I learnt later, as I overwhelmed the manager with questions, that the main door was made by Mohamed Kijuma, a famous Swahili poet and carpenter from Lamu. Now I wanted to find him too, to make a door like that for me, even though I didn’t know what I would even do with it. That thought lasted exactly five seconds, before I got distracted by the Swahili splendor again. 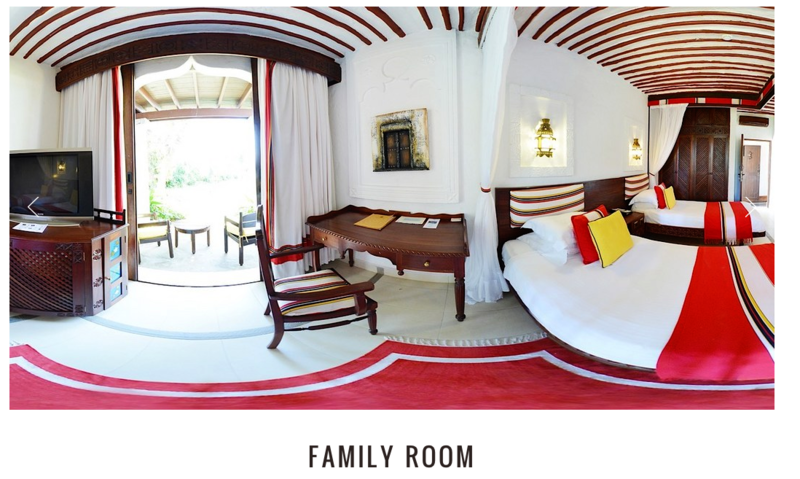 The other crime scene was the balcony of one of the Zanzibar Suites, somewhere behind the photographer in this image. The staircase handrails are all wooden, even the one my gorgeous date, paralysed by seafood and a beer that had been a bad idea, would be supporting herself on a few hours later. 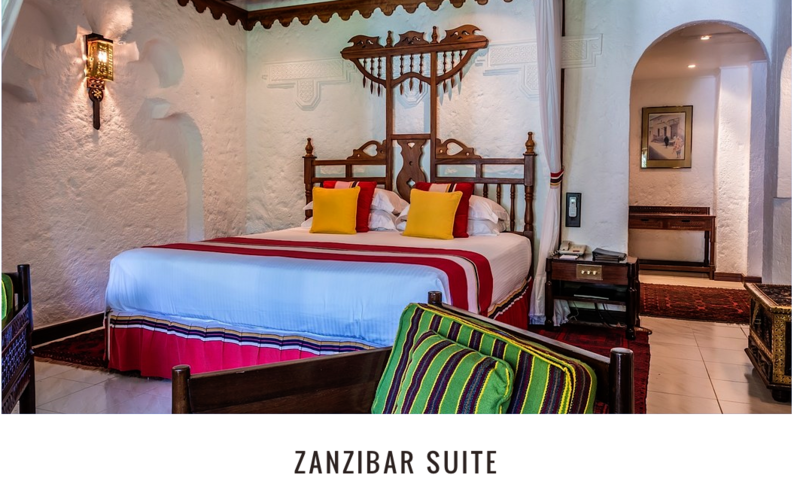 The queen bed in the Zanzibar suite, where she collapsed shortly after, was wooden as well, and draped in white. The first thing we’d done when we got there was go to the balcony. The room has courtyard views from the balcony, and the view is fringed with white beaches and coconut palms. We carried a bowl of fruits outside, and started gazing at monkeys swinging from the trees. We would learn later, after one monkey organized and executed the banana heist of the century, that there’s a staff member whose entire job is to keep the monkeys away. It sounds like a fun job, because monkeys learn fast and will mess with you. Every day is an adventure if your job description is monkeying around. We were only noticing them because he had just left, and clearly the monkey scouts had sent word that the guard was finally not in sight. All I remember is a yelp, a sudden tug on my shirt, and the tail of a monkey making away with a banana and an apple. He didn’t even run. 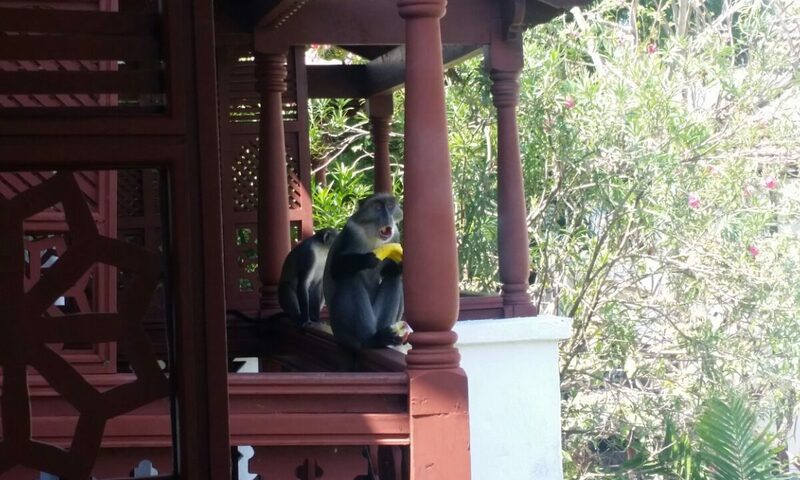 He just jumped to the next balcony, turned his back to his friend who had clearly not done his part, and facing us, elaborately peeled and ate the banana. He’d bit into the apple first, to clean his palate, then held it between his legs before attacking the banana. I wouldn’t have been more insulted if he hit me with the peel after. My love for history and bananas are not necessarily related, and maybe the monkey stole my banana so I could focus on the history. I was missing the wells, the crafted ruins, and there is even a marketplace! I’m sort of glad he did though, although I caught feelings when I thought about it later. 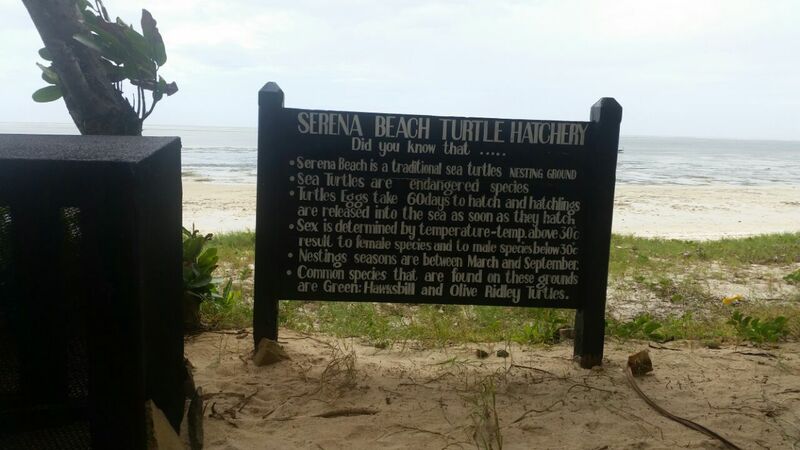 The main part of the previous tour, which I’d missed as I sat on a hired plastic chair on the beach with a bottle of rum at my feet, was the turtle and butterfly conservation parts of Serena Beach Resort. 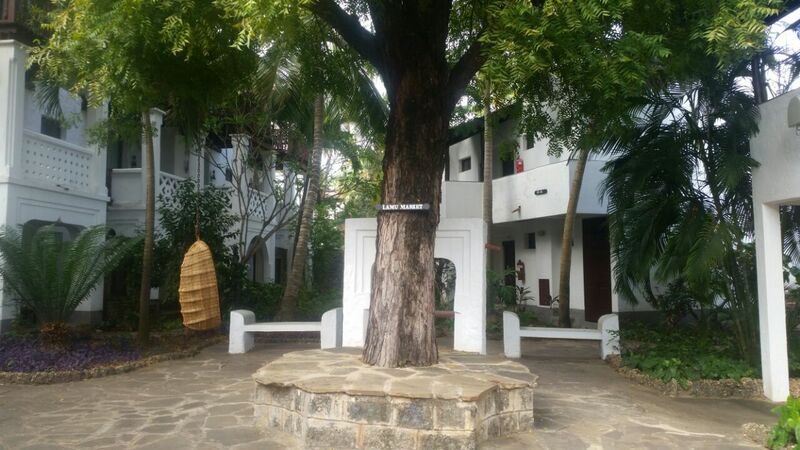 The hotel has a turtle conservation project which has clocked more than two decades. Even though they’ve released tens of thousands of hatchlings into the sea, we weren’t so lucky. We got there the day after the most recent team of turtle saviours had been released, so we had to make do with imagining how they look in the hatches. But the butterflies! Oh, the butterflies! I have a thing for butterflies. There’s a period earlier this year when I insisted on asking anyone who crossed my path whether they had seen butterflies lately. When you write for a living, you get away with nagging people with questions like this. 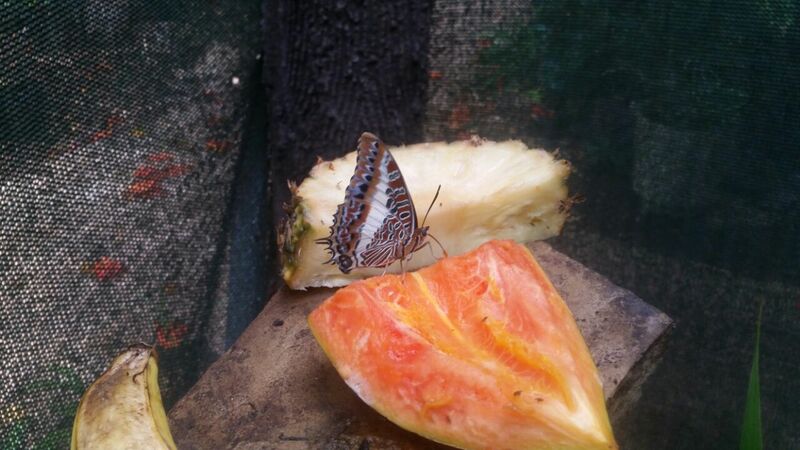 So more than one person, the deities bless their souls, took photos of any and all butterflies and sent them to me. And my heart wasn’t sated, it wanted more. 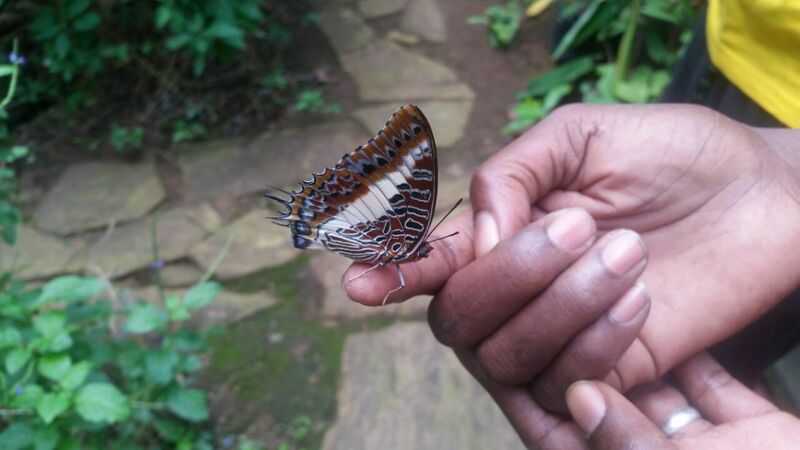 It wanted to be at the butterfly shelter at Serena Beach Resort & Spa. It wanted to live there, to write there, like Stephen and his colleague. First scene: A member of the species satisfying local tourists. There’s something oddly beautiful about people who take care of delicate beings like butterflies. But when you see how Stephen cradles the butterflies, so delicately that you feel like you are holding them wrong, you realize why he is the guy in charge of the project. There were more than two pairs of butterflies loving each other in the open, which is actually a good thing for the species. Maybe I stared at them for too long, and had too much fun pointing out mating pairs on the ceiling. I could defend myself and say the joy was because this delicate species was helping those helping it, by doing the deed often and in public. But I’m just naughty, and I have been a member of an entire team that spent an hour watching lions mate. More than once in my travels, if I’m to be truthful. Second scene: Like a proper Kenyan, going for lunch immediately after sending two emails. (and do you see the banana? I wanted to steal it, but someone would have noticed). The monkeys are not Serena Beach Resort’s only cheeky animals. There’s a pair of parrots in a cage somewhere at the far end of the lobby, as you head up to Nyota Bar. We heard them before we saw them, as we made our way to the bar (of course). To be clear, we heard one. It catcalled her, whistled like a mjengo guy hanging outside a workplace. We both turned back ready for a fight, only to realize, after about a minute of questioning our sanity, that it had been one of the parrots all along! When we moved closer, the naughty parrot was quiet and nonchalant. 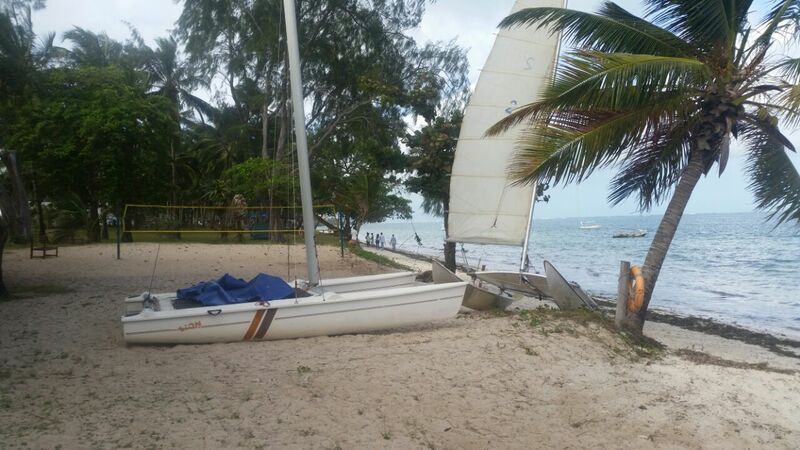 The next day, we took a catamaran out to the sea. A catamaran is a weird sea vessel, especially in this day and time. It has two parallel hulls connected by a canvas. You sit on the canvas and get wet, very. While writing this piece, I dove into the wormhole of trying to understand how it even works. By the time I came out of it I knew even less. See where that blue thing is? That’s exactly where you sit and get wet in all the right places. All I could make out was that a catamaran gives you speed but reduces the load you can carry. That includes phones, shoes, and if you can, clothes if you don’t have others to change into after. Trying not to get wet while cruising the ocean on a catamaran is an extreme sport. And if you have weird paranoia like me, the lack of any wall structures keeps making you afraid you might fall into the sea. But no one did, and we explored Indian Ocean for about an hour on this weird sea vessel. We watched guys on speed boats, and chuckled that although they were faster, their vessels could run out of fuel and then they would be stuck. We, meanwhile, could manipulate the wind to find an undiscovered city state to visit. By the time we got back, we needed a shower and a change of clothes before we could even think of submitting ourselves to Capt. Sparrow’s wickedness. 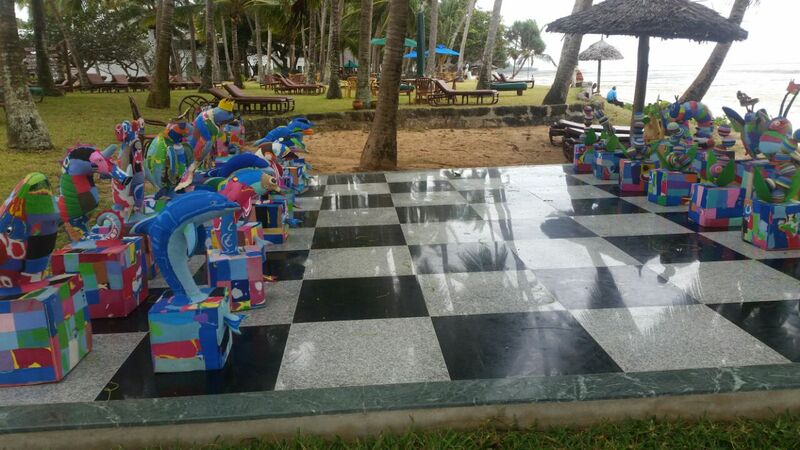 There’s also a massive chess board with pieces made from recycled slippers. I cleared three quarters of my fish, but she couldn’t do half the bowl of prawns in front of her. Capt. Sparrow was still smiling when he came to clear the plates and asked if we wanted dessert; and actually chuckled when we simultaneously turned to look at him with eyes that said “Do you want to kill us with food, sir? !” That’s why she was now waddling. Why she didn’t have space for beers after, as we sat at Nyota Bar unwinding. Why, a few minutes after that we left and she waddled all the way, through the narrow streets, and up the staircase to our room. All she had energy to do was remove the red flowery dress and collapse on the bed, into a food coma that lasted until the next morning. I, meanwhile, went to the balcony to have a double of rum. 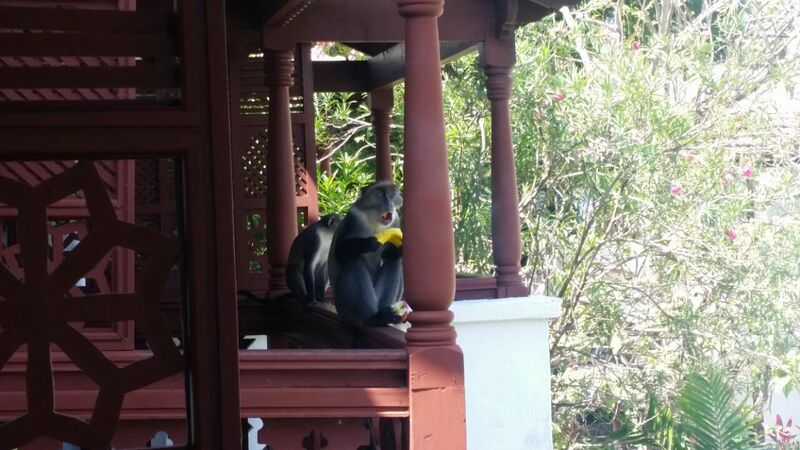 And to see whether I could identify the monkey that had stolen our fruits earlier. It was a quiet evening; the monkeys, it seemed, were somewhere else doing Monkey-God knows what. If you happen to go to Serena Beach Resort & Spa soon [Link], and spot that criminal of a monkey, tell him I haven’t forgotten.